One of five films featuring Anton Yelchin released posthumously, Thoroughbreds is solid, but little more than that. 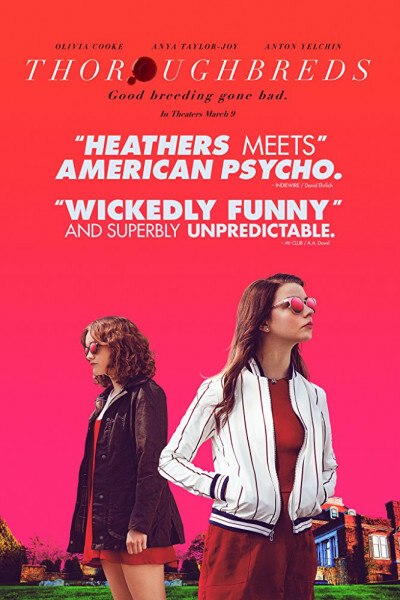 I like Olivia Cooke (who plays the psychopath here), and Anya Taylor-Joy has been knocking the cover off the ball since 2015's The Witch and 2016's Split. Her huge, wide-set eyes and cupid bow lips hide what is often a wry, sinister side. She's got seven unreleased films on the way that further illustrate the point, from Glass (the third M. Night Shyamalan film featuring Bruce Willis as David Dunn) to 2019's creepy Marvel entry, The New Mutants, which can be best classified as horror genre. See what I mean? Behind all that, a rather sinister side. Thoroughbreds is no exception. Mind your family jewels.